Hanoi (VNA) – Vietnam’s Defence Minister Gen. Ngo Xuan Lich and his Australian counterpart Marise Payne agreed to consider the organisation of the first deputy ministerial defence policy dialogue and Australia’s support for Vietnam’s deployment of UN peace keeping forces during their talks in Hanoi on August 24. Australia’s Defence Minister Marise Payne is on an official visit to Vietnam on August 24-25. This is the fourth official visit to Vietnam by a defence minister of Australia since the two countries set up defence ties in 1999, which realises bilateral commitments to intensifying defence cooperation for peace, stability, and wealth of the region. At the talks, the ministers discussed regional security issues of shared concern and orientations for bilateral defence cooperative activities in the coming time. They shared the view that the two countries’ defence cooperation is substantive, stable, and sustainable, and it is in line with the memorandum of understanding on defence cooperation inked in 2010. 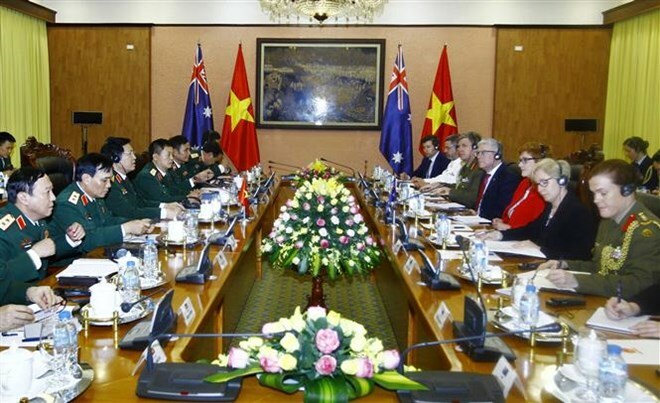 Minister Payne thanked the Vietnamese Defence Ministry for its support for Australia’s initiative to hold the ADMM annually, and asserted that Australia will continue contributing to the success of this important mechanism. During her visit, Minister Payne will visit Company 871 and Commando Brigade 113.